Cycling holidays in the heart of rural france. Family-friendly bimbles to the boulangerie. Bring the kids. Family-friendly bimbles to the boulangerie. Killing the kilometres with companions. Group holidays with friends. Kill the kilometres with companions. Kidless and care-free along the canals. Treat your other half. Kidless and care-free along the canals. Find your ride in the French countryside. 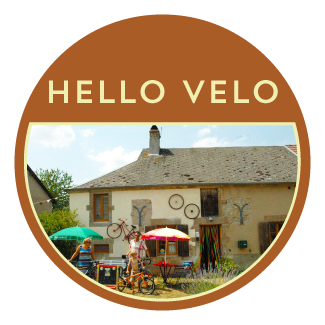 Hello Velo is a family friendly cycling holiday company, based in the tiny hamlet of Grond right in the heart of rural Burgundy. We (Jo, Greg and Solomon) moved here to renovate an old barn that we fell in love with before Solomon existed. He’s now nine! Slowly it’s turned into a magnificent home with colourful, guest accommodation. We’d like to share it with you. You’ll find us in Grond, the Nievre, Burgundy where the 175 km Nivernais canal bisects the fertile farmlands of the beautiful Bazois. Safe cycling for everyone. Perfect relaxation. The heart of rural France is not as difficult to get to as it first might seem. We’ll help you get to this stunning part of France and then you won’t want to leave! If you would prefer, we also offer the opportunity to put your tent up in our large garden and sleep beneath the stars (which are magnificent on a clear night!) There are shower and toilet facilities available in the house and we offer the hospitality of breakfast and 6 evening meals around our dining room table. Finished cycling for the day? Or are you pausing from the peddling! Relax and sip something cold while the kids play in the garden. A family ride to a local place of interest every Thursday evening – and you’re most welcome to join us! Leave the bikes at Hello Velo! Go and explore what Burgundy has to offer without being in the saddle.